This review is for the first volume of Kagerou Daze by Jin (AKA “Shizen no Teki-P”). The English edition was released by Yen Press in May 2015. The second volume released in September 2015, and will be followed by the third in January 2016. So far, there are seven volumes available in Japan. From June to August of this year, I ran a light novel summer reading program in which I invited everyone to read selected books and discuss them a bit each week. 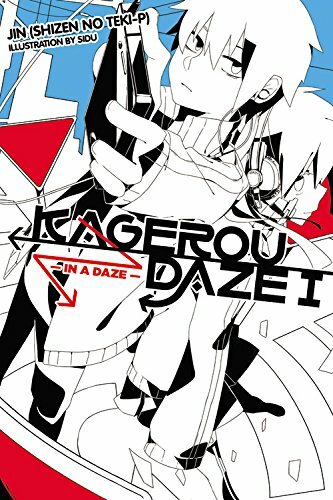 The first volume of Kagerou Daze (subtitled “In a Daze”) was one of the two books we focused on for June, and it worked nicely for a three-week discussion as it is divided into three clear acts: Jinzou Enemy, Kisaragi Attention, and Mekakushi Chord. Jinzou Enemy follows a shut-in boy named Shintaro and the A.I. of his computer that takes the form of a girl named Ene. Catastrophe strikes however when Shintaro’s keyboard is ruined by a soda-tipping mishap, and due to a holiday he is forced to go out to a mall to buy a new one, rather than rely on delayed online shipping. The mishaps that follow take a turn for the dramatic and unlikely, making for a story I found both engaging and amusing. The voice for Shintaro’s narration is strong, and his dialogue with Ene is consistently as witty as it is comical. The novel shifts gears for the next two acts, following Shintaro’s sister Momo–a girl who faces issues as a student who works as a pop star idol and actress. Kisaragi Attention is devoted to introducing a larger cast of characters–namely a number of kids who form a group called “Mekakushi-dan,” where it appears everyone has some kind of supernatural talent. The abilities are of the less typical variety, such as one being able to move about unnoticed by others, and another being able to easily capture everyone’s attention. Mekakushi Cord ends the story of this volume by serving as a retelling of the first act, but from the point of view of Momo and the Mekakushi-dan. All in all I found this an enjoyable read. It’s a bit difficult to tell where the story is trying to go in the long scheme of things, but the characters have a lot of charm to them. It’s fun to just watch them make jabs at each other and look for silly ways to pass the time, giving the story a quirky Little Busters-like friendship theme underlying all the plot developments. The characters are funny, and thus easy to root for. Perhaps worth noting is that this story is based on a series of Vocaloid music videos known as the Kagerou Project. I did not watch any of these before reading this, but the story stands up on its own just fine. (I had no trouble following anything that was going on.) The prose itself is quite simplistic and informal, even for a light novel–but I did not particularly mind, given the story’s generally more lighthearted tone. This volume doesn’t have a whole lot that happens, which perhaps means it isn’t as likely to stick with you for very long once you’ve finished reading it–but still, it’s fun while it lasts.